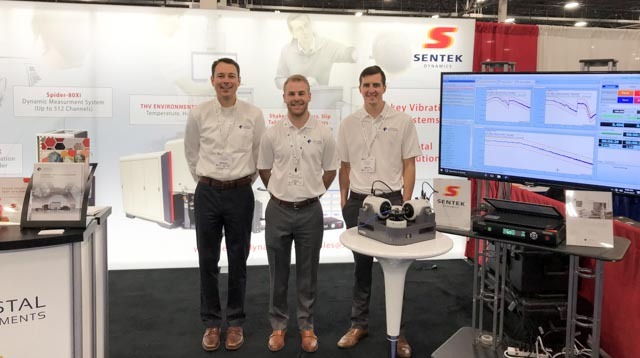 The 2017 Automotive Testing Expo provided a full display of Sentek Dynamics’ latest environmental testing capabilities. Not only was a simultaneous 3-axis vibration test system on display, it was paired with a Crystal Instruments Spider-81 multi-axis capable vibration controller as well. In addition, the recently released temperature, humidity, and vibration environmental testing line boasted a clean, cutting edge chamber design to pair with Sentek Dynamics’ industry leading air and water-cooled electrodynamic shakers. When paired with the Spider-100, the Sentek Dynamics solution offers independent control of temperature, humidity, and 3-axis vibration control all from a single control PC, which makes the offering unique to the market. Whatever the automotive environmental testing needs, look no further than Sentek Dynamics and Crystal Instruments for your one stop, turn-key solutions provider.